How old must I be to apply for your courses? I’m a beginner who has always wanted to give acting a try. Are your courses suitable for me and where should I start? I’m in my thirties/ forties/ fifties. Can I train to become a professional actor or is it too late? Do you have courses for children/ teenagers? Do I have to go to drama school or gain a qualification to be a professional actor? I am shy. Can I still do your courses? This is a common question. Many feel this way when coming to acting for the first time – performing in front of others can be a scary thought. However, you will find the teachers and the other members of the group very supportive and encouraging. Everybody in the group is new to acting – so everybody is in the same boat as you! I’ve applied for one of your courses, but I haven’t heard back from you. What should I do? We normally respond by email within 48 hours. If you haven’t received an email, check your junk and spam emails. If you haven’t received any response, please call us on 020 8906 6899 or email us from the website. Do you offer any other courses apart from those on your website? I’m neither a true beginner nor am I a fully-fledged pro. Do you have a course suitable for me? If you have not trained professionally and you’re serious about becoming a professional actor, you can apply for our part time, one year Ultimate Acting Programme or start with our 3 day Introduction to Method Acting Boot Camp, which serves as a great ‘taster’ for our Ultimate Acting Programme. Does Brian or his specialist coaches do one to one sessions? If you would like one to one sessions, please email us with details of the project. 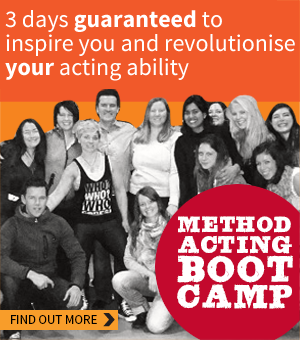 How often do you hold your Introduction to Method Acting Boot Camp? When is the latest I can apply for a Boot Camp? Depending on whether there is a place still available, you can apply anytime up until the day before the course starts. Although we do tend to sell out ahead of time, so we always advise you to apply early. How much is the Boot Camp? How often do you hold your Ultimate Acting Programme? What is required to audition for your Ultimate Acting Programme and when are the auditions? How do I do a good audition if I’m a beginner? I have a day job. Can I do your Ultimate Acting Programme and become an actor? Yes. Our courses run over Fridays, Saturdays and Sundays, allowing you to maintain your job and study to become an actor at the same time. How do I apply for your Ultimate Acting Programme? How much is the Ultimate Acting Programme?